Tucked away in two Normal neighborhoods, Evergreen Place and Evergreen Village represent exceptional options for senior adults who want to maintain their independence, but need a little help now and then. While several similar communities may dot the Bloomington-Normal landscape, none have the foundation and reputation of these two Heritage settings. Three very significant factors give support and credibility to the excellence of these Evergreen Senior Living communities. The first is the deep history of its parent company, Heritage, in Central Illinois. Second is the communities and services themselves. Third, the ongoing reputation of excellent care and feeling of community within the communities themselves support and grow the reputation of the brand. Never content to sit on their laurels, the staff and leadership continue to look to the future as well as consider the needs and wants of current community members for improving and offering the things they require and request. 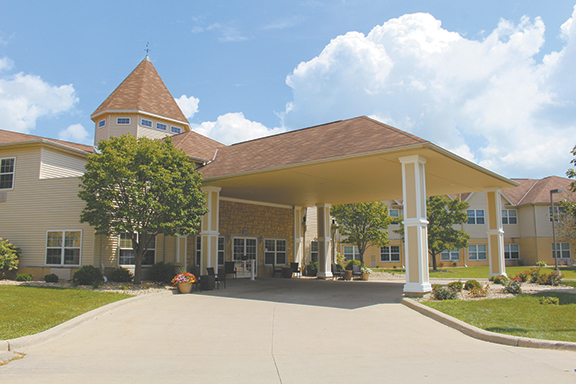 Heritage has been a leader in senior care since the early 1960s when the first facility, Heritage Manor, opened in Bloomington as one of the first nursing homes under a new Federal Housing Administration program to replace older nursing home communities. Heritage—the values of family ownership and involvement, stability, and commitment are firmly in place. Heritage Health has long been recognized in Central Illinois for providing nursing and long-term care for the elderly. However, the leadership of Heritage recognized the coming population shift with the aging Baby Boomers and saw the need for a bridge between older adults living on their own and long term care offered by nursing homes. 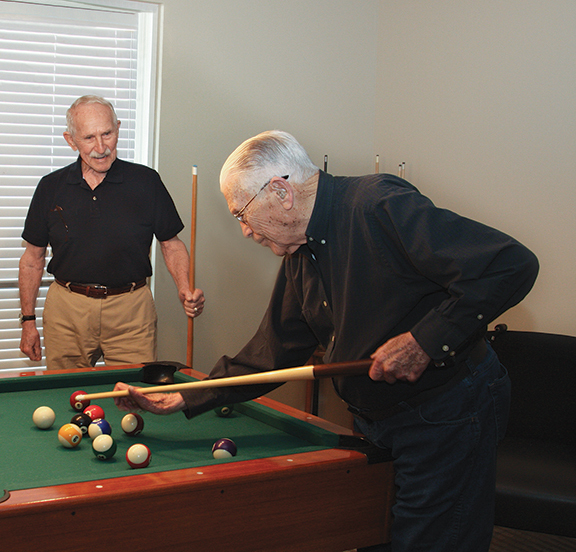 Assisted and supportive living options filled the gap. 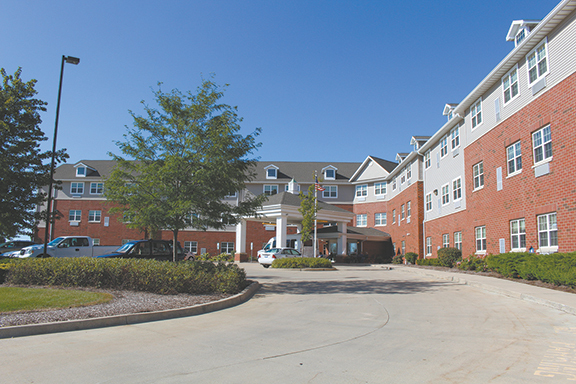 The Heritage continuum of care now spans independent living communities, assisted and supportive living, rehabilitation services, skilled nursing communities and Alzheimer’s/dementia care—a network of communities and care services throughout central Illinois that enables seniors to live comfortably and safely for many years. 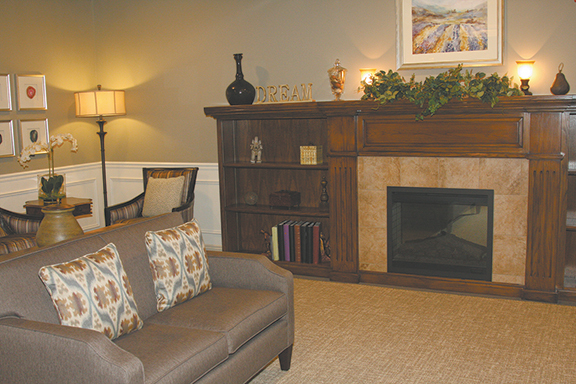 Evergreen Place, located on the corner of Adelaide and Gregory in Normal and the first licensed assisted living community in McLean County, opened in 2001. Seniors live independently in their own private apartment, but have several personal assistance and supportive services available to them. 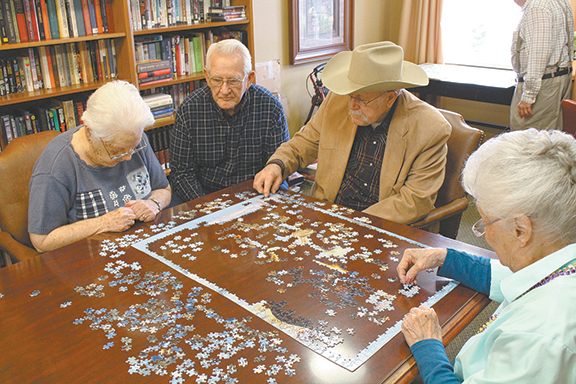 Evergreen Village, located in Normal near Calvary United Methodist Church and Prairieland Elementary School, has been providing supportive living services since 2007. The two communities offer the exact same services and options—“the only difference is that supportive living at Evergreen Village offers financial assistance to qualified seniors, including Medicaid payment options,” explains Kris Loudenback, Director of Evergreen Village. Each of the communities offers personalized levels of care for individuals—giving them as much or as little help as they need. Services can include medication reminders and management, 24-hour wellness support, three daily meals, housekeeping and laundry, personalized assistance with tasks of daily living, transportation, as well as a host of activities and programs for social, emotional, and spiritual support. The details make a difference for each of the services provided. For example, residents have access to a fitness center, barber or beauty salon, and library—all on-site…and all at no additional cost. Laundry service is provided for linens and personal laundry can be added. But, it’s easy enough to do laundry, as there are washers and dryers on each floor. And no quarters are required for operation (no quarters, no debit cards, no money—they are free of charge). 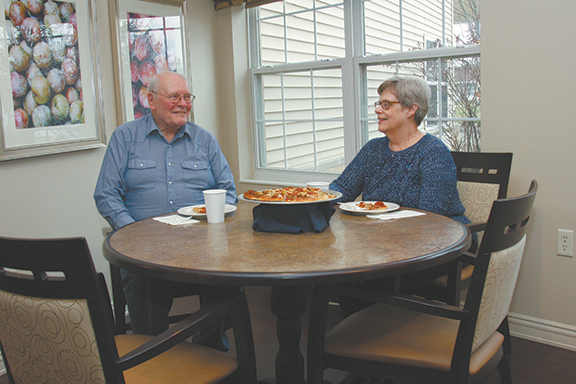 The meals are served restaurant style, so residents sit where they want and with whom they want. The servers take their orders and bring their meal. The menu offers a variety of options for each meal. 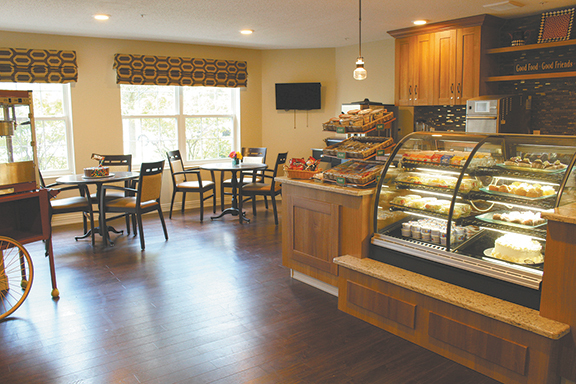 If, however, a resident wants a change of pace, or needs a snack, there is also a small café that has a diverse selection of snacks—again, at no additional charge. Each apartment has central air and heating, so the temperature is up to the resident to decide what is comfortable. A small kitchenette contains oak cabinets and a small refrigerator and microwave. If a resident needs an oven to make a special treat, say a favorite cookie recipe, there is one available in the Community Center. Evergreen Place offers 60 apartments, including studio and 1 and 2 bedroom units. There are three different floor plans for the 2 bedroom units, although they are the same total square footage. Evergreen Village has 99 studio and 1-bedroom apartments. Some favorite items can be creatively used as décor. 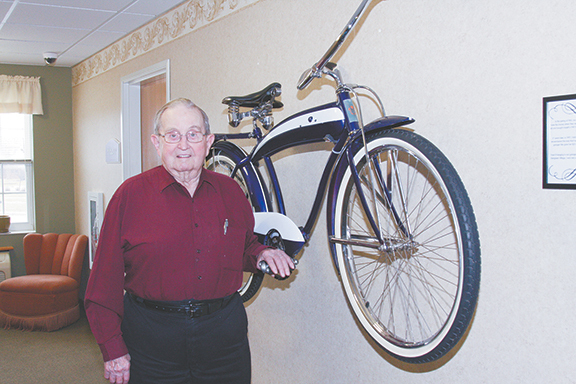 “We have a resident who loved to bike, but he no longer used his older-style bike. So when he moved in, he mounted it on the wall!” says Loudenback. Considering residents’ needs and desires is another hallmark of the Heritage family of care communities. “We learn new things with each new facility,” says Benton, citing the example of wi-fi availability. 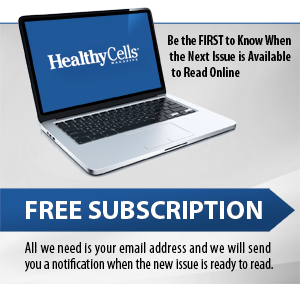 “We used to have a computer available for residents to use, but over the years, it’s become more common for them to have their own. Providing wi-fi made sense.” Residents have also given input regarding the configuration and space of the apartments and other parts of the facility. 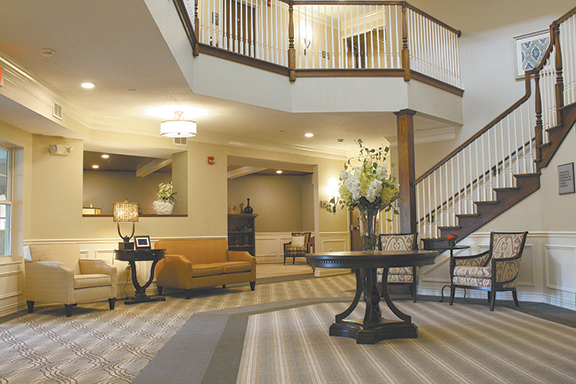 Evergreen Place underwent recent renovations, many of which included input from residents. In fact, this aspect of customer service is an organization-wide initiative that emphasizes the positive relationships between residents, family members, staff, volunteers. The program, called “H to O”—meaning Happy to Oblige—encourages communication and service. Residents, family members, co-workers, staff—anyone can nominate someone for an H to O award. Examples of nominations include two CNAs who helped change a resident’s flat tire, a staff member searching the garbage for dentures that had accidentally been thrown away, and someone handwriting a letter for a resident. The winner of the quarterly H to O award gets a paid day off. “I had 33 nominations last quarter,” says Benton. Proof that the staff enjoys their work and goes beyond the call of duty on a regular basis. The assisted and supportive living options at Evergreen Place and Evergreen Village offer customized personal care services to seniors who want to live independently. As two of the 11 assisted living and supported living under the Heritage umbrella, they provide another link in the continuum of care that enables seniors to transition easily between services and locations as their age and health require. For more information about Evergreen Place or Evergreen Village, call (309) 834-2603 or visit online at EvergreenSLC.com.